Mobile graphics processor company Imagination Technologies has launched a new range of Graphics Processing Units (GPUs) which are meant to provide next generation graphics for products including wearables and Internet of Things (IoT) devices. 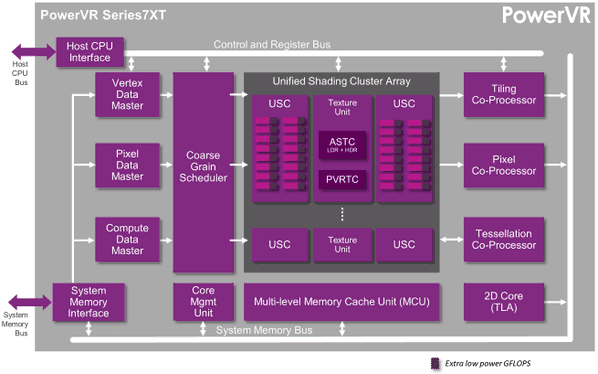 The PowerVR Series7 graphics chips can be configured with between 16 to 512 arithmetic cores which Imagination says provides “unprecedented scalability, efficiency and performance”. With the range of mobile devices becoming ever more diverse the PowerVR Series7 chips aim to provide right-sized solutions for your devices – all the way from the smallest wearable or IoT device through smartphones and tablets and up to large screen powering smart TVs and games consoles. The new chips are spilt into two distinct sub-ranges; the Series7XE which are optimized for area, efficiency and feature configurability and the Series7XT which can offer dramatically scalable performance from 100 GFLOPS to 1.5 TFLOPS. To match the wide range of performance options Imagination is offering a wide range of OS support to include Google Android, Microsoft DirectX and OpenCL. Looking at the new performance figures Imagination says that its PowerVR Series7 graphics chips can outclass its previous generation Series6 chips in performance by around 60%. Pixel fill-rates, polygon throughput and efficiency are all improved. Furthermore GPU compute can be as good as 300% better than the previous generation of chips. We won’t be seeing any products sporting these new faster and more efficient processors until late in 2015 but its good to see them on their way to make the gadgets we love even more irresistible.